A research group has produced more efficient OLED material using molecules shaped like wagon-wheel pasta, not like the usual spaghetti. Spaghetti is a good characterization of the polymers in which light is produced in OLEDs used in smartphone displays (such as the Samsung Galaxy series), in a new generation of TVs made by Sony and others, and in lighting. The light that emerges is polarized -- this is a function of the one-dimensional nature of the light-producing medium. In a sense, the light has only one way it can vibrate. This polarization contributes to steep losses in the OLED medium, with as much as 80 percent of the light trapped in the spaghetti-like strands. Researchers from the University of Utah and two universities in Germany sought to give this light room to vibrate in more directions. 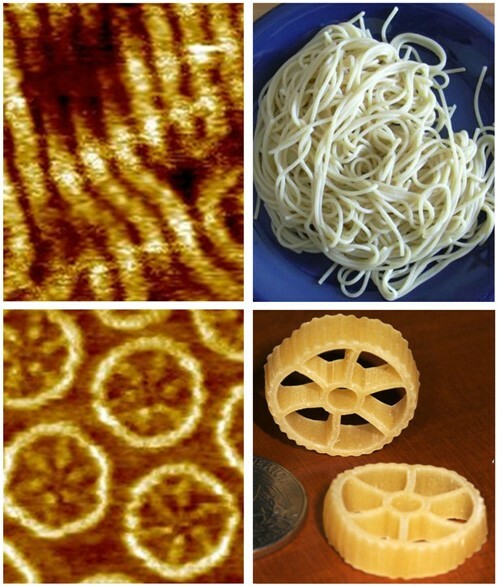 They ended up producing molecules shaped like rotelle or wagon-wheel pasta (see below). As it turns out, this shape produces light with random polarization. The researchers published their work in Nature Chemistry (subscription required). Images of molecules for OLEDs (left) compared with similar shaped pasta (right). The molecules are oligomers, called π-conjugated spoked-wheel macrocycles, that are essentially wrapped-up polymers. They are 6 nm across; that's large for a molecule but 0.00006 the diameter of a human hair (100,000 nm). The researchers measured single photons coming off a single rotelle-shaped molecule and determined that each photon emerges with a different and random polarization. John Lupton, a University of Utah physicist and lead author on the study, says that the rotelle approach might eventually double the light that can be extracted from an OLED. Years from now, when (and if) this basic research is translated into products, it could lead to longer battery life for smartphones and other portable devices. Lupton and the other researchers at University of Utah work in a different group from those pursuing the generation of white light from a single OLED medium. Blaine Bateman wrote about that research work last month.